DETROIT, Michigan (WPVI) -- The baby born of a Michigan woman who chose to forgo chemotherapy to give birth to the child has died, a relative said Thursday. WTVD-TV reports, Life Lynn DeKlyen died Wednesday evening at the University of Michigan Hospital in Ann Arbor, her aunt Sonya Nelson said. Life's mother, Carrie DeKlyen, died September 9, just three days after giving birth to her sixth child. "It is with great sadness and a absolutely broken heart that I tell you Life Lynn passed away last night. Carrie is now rocking her baby girl. I have no explanation of why this happened, but I do know Jesus loves us and someday we will know why. The grief we feel is almost unbearable, please be praying for our family." 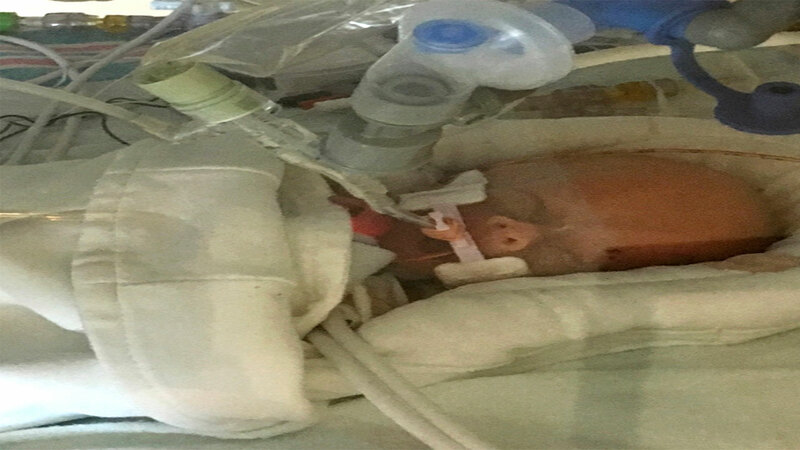 Relatives said Life had been doing better than expected after being born prematurely, weighing 1 pound, 4 ounces. Nelson told The Associated Press the baby had good and bad days at the hospital, but "took a turn for the worse." "We don't have any answers," Nelson said, adding "the cards were kind of stacked against her" after being born at 24 weeks and five days into the pregnancy - about "the earliest you can survive." But Nelson is holding is head up high. "Maybe Carrie needed her," Nelson said. "It is comforting for us to know that she went home to be with Carrie." Carrie DeKlyen declined to participate in a clinical trial or undergo treatment for the brain cancer because it would have meant ending her pregnancy. Her husband, Nick DeKlyen, has said their decisions were rooted in their Christian faith. The DeKlyens have five other children who range in age from 2 to 18. "Our deepest sympathies go to the DeKlyen family during this time of sorrow," hospital officials said in a statement. "Our team is saddened by the losses of Carrie and Life, and we hope their friends and family can find comfort and peace from their memories." A GoFundMe account created by the family has raised over $157,000.